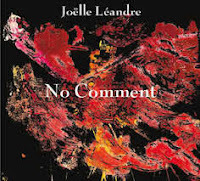 I have to confess, I almost don’t know how to write about Joëlle Léandre, or any other transformative, hugely influential artist. Almost. On the one hand, I really want to step aside and just let each recording tell its own story. For that, all you need to know is No Comment is a reissue of an album originally released, on Red Toucan Records, about 15 years ago. It features Léandre performing solo at and the 1995 Vancouver Jazz Festival and the 1994 Ibleo Jazz Festival. On the other hand, with so many new releases coming every week and so many new artists to discover (and whose hype, admittedly, dominates the news cycle), it’s vital to continue writing about musicians whose art has retained its transformative fire. With any prolific artist’s discography at hand, it’s hard to say what’s a necessary release or even a jumping off point. But No Comment makes a good argument for itself as a bit of each. For one, any solo artist should be heard in that format as much as possible, to get the full range of their performances. And as for being a jumping off point, there was, for me, no bad place to start listening to Joëlle Léandre. So, why not jump in right here?